(CNS): The global picture presents a bleak scenario of the double burden of TB and diabetes, in so much as a communicable and a non-communicable disease seem to have joined hands to threaten public health. That's why the forthcoming first-ever Global TB Diabetes Summit in Indonesia becomes important for galvanizing effective and collaborative public health responses. TB: As per WHO's Global TB Report 2015, 9.6 million people fell ill with TB in 2014, and 1.5 million people died from it. Only 63% of those estimated to be having TB were notified to national TB programmes. This means that worldwide, 37% of new cases went undiagnosed or were not reported, reflecting a gap in both reporting of detected cases and access to care. Of the 9.6 million new TB cases in 2014, 58% were in the South-East Asia and Western Pacific regions. TB and diabetes interact with each other on a number of levels. 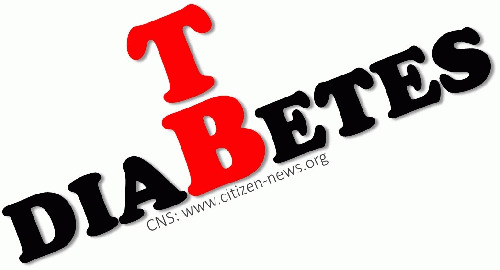 Diabetes triples a person's risk of developing TB. Studies have found that DM in TB patients is associated with poor TB treatment outcomes--possible delay in sputum culture conversion-- increased risk of TB treatment failure/TB related deaths and also increased risk of recurrence of TB after successful treatment.